1. Wild And Soft Plush Albert The White Tiger £45.00 [x] : A play on having an animal head on your wall (I'd never want the real thing), this white tiger would look adorable in any child's room. Plus there are several different animal heads you can choose from including lions, elephants and even sharks! 2. Corby Tindersticks Soft Toy Crocodile £26.00 [x] : If you love quirkiness, then meet this fun little crocodile. He's pretty pricey, but if you want something a little special then he's perfect. 3. Tobias and The Bear, Ned The Elephant Cushion £16.00 [x] : If you're looking to buy pieces that will age with your child, then this elephant cushion is perfect. It's cute but stylish enough that it could be in a kid's room or an adult's. 4. Noodoll's Rice Papa Soft Toy £17.50 [x] : I actually own a Noodoll toy but in a different design so I have a little bit of a soft spot for them. 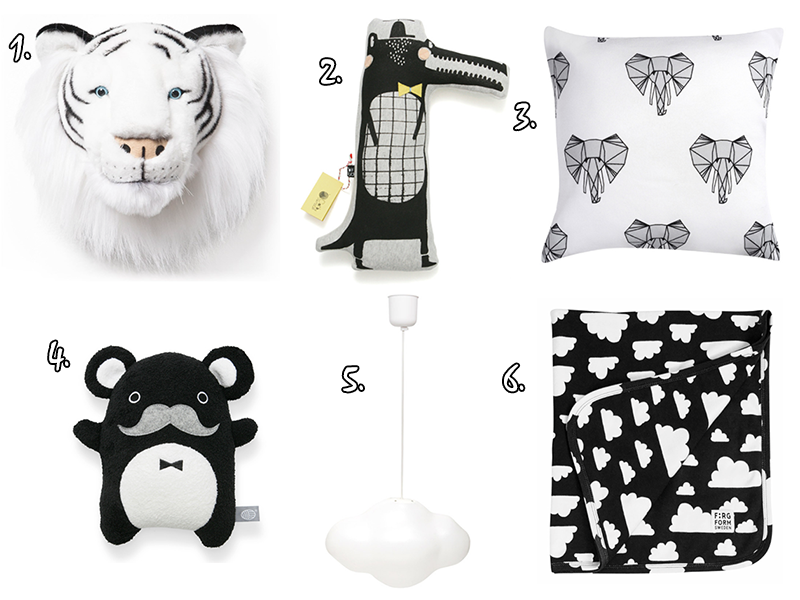 I love how cool and dapper Rice Papa is and he'd fit perfectly into a cool monochrome kid's room. 5. Cloud Ceiling Light £55.00 [x] : This is the sort of thing I wish I'd had in my bedroom as a child. There's something really magical about having a cloud light, and it would work perfectly for so many bedroom themes. 6. Farg Form Black and White Clouds Soft Jersey Baby blanket £20.00 [x] : I'm pretty sure this is the coolest baby blanket I've ever seen and the best part is it's a lovely soft jersey blanket so perfect for any baby to snuggle in. Thank you for reading lovelies - and happy Monday! I agree the white tiger head is a pretty one to have in a child's room and also agree about the stuffed animal heads, I find it to be freaking creepy and wrong, never want a real one either! The cloud ceiling light is so cute! I can't wait to have kids one day and decorate their rooms!